Our daily lives have become so chaotic and rushed these days that we rarely have time to pay attention to the most vital aspect of our human lives; our direct relationship with other human beings. We rush around completing our infinite to-do lists and have become completely attached to our technological devices. If you haven’t noticed yet, many people and (perhaps you) spend the majority of their day with their heads down frantically updating their status, tweeting, checking emails or trying to find Pokemon in their vicinity. Amazingly, this seems to go on even when people are out for an intimate dinner, watching a movie, or whatever “social” activity they might be engaged in. Do people even talk to each other anymore? Don’t get me wrong, our highly advanced technological society certainly has benefits, however I believe one clear downfall has been the lack of interest in the development and continued growth in social relationships that involve real human contact. If you want to escape this technology trap and unhealthy trend the key is the practice of mindfulness. Mindfulness is a very simple, yet effective way to improve all areas of your life; it is a holistic practice benefiting your mind, body, and soul. Improving and developing your social relationships will have a healing effect on all three aspects of your life. Recent scientific studies have shown the practice of mindfulness to greatly improve our social and intimate relationships in many ways. 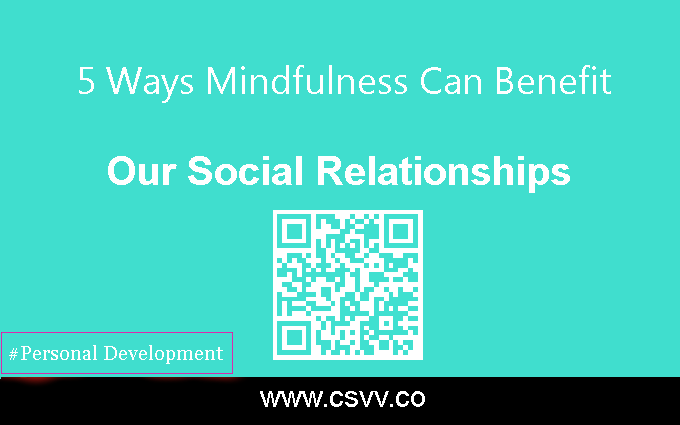 For the purpose of this brief article I will discuss five of the ways mindfulness benefits our social relationships. Instead of living in past regret or worrying about the future, we simply experience life right in this very moment. The moment is all we ever have, so when we practice mindfulness we are genuinely living and being, and not constantly doing. We are experiencing the essence of life. Perhaps you can imagine how living this way can benefit you in many ways, especially how we related to other human beings. 1. Listening Skills – Living in a present centered way allows us to actually concentrate single pointedly and hear what others are saying, and not planning our response in our minds or checking our phones. When someone is expressing something to us we can show them that they are important enough to listen and that what they are saying matters. Believe me people know when you are genuinely listening to them and when you are just a shell of a person standing there doing something else. 2. Responding Skills – In addition to mindfulness helping us to listen to others, it also helps us to take a step back and pause before we impulsively blurt things out. We can actually assess what we are planning on saying before we say it. This helps us to respond effectively and appropriately as well as communicate about things that really matter, rather than gossiping, arguing, or just talking to hear ourselves talk. This relates to the Buddhist principle of Right Speech. 3. Human Connection – Mindfulness allows us to be still and quiet our mind. In turn we begin to have access to our heart which increases our want to have an intimate connection with others. When we begin to detach from our ego, the world around us becomes much more important and our connection with everything becomes obvious. The realization that we are not the center of the Universe is enlightening. 4. Empathy – When we slow down and form connections with other human beings we start to realize that other people are very similar to ourselves. We can step into their shoes and experience deep compassion for their pain and suffering. Empathy is an extraordinary skill that is vital to the development of healthy and fulfilling relationships. We can increase our ability to empathize by practicing mindfulness on a regular basis. 5. Less Stress – Mindfulness decreases our levels of stress dramatically. We grasp the understanding that we can only do one thing at a time and that life consists of much more than our to-do lists. With less stress our life becomes more efficient and we actually have more time for social relationships and more meaningful activities in our life. Our priorities begin to change and a new life emerges. Do the benefits of mindfulness sound appealing to you? You can have them all. I believe mindfulness is the secret we have searched for outside of ourselves for way too long; its been right in front of us all along. Experiment with mindfulness for a day and if you don’t enjoy the peace it brings, your old life will be there waiting for you. Richard Singer is first of all a real human being who is quite faulty and still struggles with life on a daily basis, however on a worldly basis he is an award winning author, trained psychotherapist, adjunct professor, and most importantly a seeker of truth. He continuously searches for wisdom to use in his life, as well as helping other human beings in their precious journey. He has studied Eastern Psychology, Buddhist Healing, and Non-Violence at the Doctoral Level; in addition, he has spent years devoted to the study of wisdom recorded throughout history. He seeks to impart this knowledge to the world through his writing. Richard’s new book Eastern Wisdom Western Soul is due to be released in August 2016 by Devorss Publications. You can find out more at www.RickSingerBooks.com.